Everyone knows that the American consumer is deleveraging … living more frugally, and paying down debt. I opened up a big can of debate Monday, when I repeated some chatter around that consumer spending might be juiced by all those folks not paying their mortgages. They have a little extra cash, so they’re spending it at the mall. Some of you thought the premise had some validity, others, as is often the case, told me I was an idiot. Well after the blog went up Erin Burnett put the question to Economist Robert Shiller, of the S&P/Case Shiller Home Price Index, during an interview on Street Signs. Then I decided to ask Mark Zandi, of Moody’s Economy.com, who will often shoot down my more ridiculous theories. No, not crazy. With some 6 million homeowners not making mortgage payments (some loans are in trial mod programs and paying something but still in delinquency or default status) , this is probably freeing up roughly $8 billion in cash each month. Assuming this cash is spent (not too bad an assumption), it amounts to nearly one percent of consumer spending. The saving rate is also much lower as a result. The impact on spending growth is less significant as that is a function of the change in the number of homeowners not making payments. I’m not sure I would say this is juicing up spending, but resulting in more spending than would be the case otherwise. Many of these stressed homeowners (due to unemployment) are reducing their spending, just not as much as they would have if they were still making their mortgage payment. Okay, so 6 million American homeowners are not being super frugal about either paying their mortgages or saving the money for another investment. But surely the hundreds of millions of other Americans are reducing debt and deleveraging, right? The sharp decline in U.S. household debt over the past couple years has conjured up images of people across the country tightening their belts in order to pay down their mortgages and credit-card balances. A closer look, though, suggests a different picture: Some are defaulting, while the rest aren’t making much of a dent in their debts at all. First, consider household debt. Over the two years ending June 2010, the total value of home-mortgage debt and consumer credit outstanding has fallen by about $610 billion, to $12.6 trillion, according to the Federal Reserve. That’s an annualized decline of about 2.3%, which is pretty impressive given the fact that such debts grew at an annualized rate in excess of 10% over the previous decade. There are two ways, though, that the debts can decline: People can pay off existing loans, or they can renege on the loans, forcing the lender to charge them off. As it happens, the latter accounted for almost all the decline. 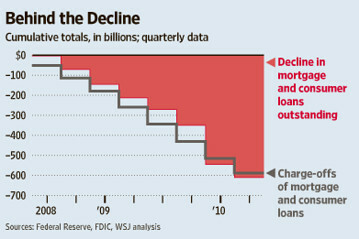 Over the two years ending June 2010, banks and other lenders charged off a total of about $588 billion in mortgage and consumer loans, according to data from the Fed and the Federal Deposit Insurance Corp.
That means consumers managed to shave off only $22 billion in debt through the kind of belt-tightening we typically envision. In other words, in the absence of defaults, they would have achieved an annualized decline of only 0.08%. From a peak in 2005 of $13.1 trillion in equity in residential real estate, that value has now diminished by approximately half to $6.67 trillion! Yet outstanding household debt has in fact increased from $11.7 trillion to $13.5 trillion today. Folks, those who claim that we have “de-levered” are lying. Not only has the consumer not de-levered but business is actually gearing up – putting the lie to any claim that they have “record cash.” Well, yes, but they also have record debt, and instead of decreasing leverage levels they’re adding to them. In short don’t believe the BS about “de-leveraging has occurred and we’re in good shape.” We most certainly have not de-levered, we most certainly are not in good shape, and the Federal borrowing is what, for the time being, has prevented reality from sticking it’s head under the corner of the tent. Indeed, as I’ve pointed out repeatedly, the government has done everything it can to prevent deleveraging by the financial companies, and to re-lever up the economy to dizzying levels. You can’t open a newspaper or watch a business news network without seeing or hearing that consumers and businesses have been de-leveraging. The storyline as portrayed by the mainstream media is that consumers and corporations have seen the light and are paying off debts and living within their means. Austerity has broken out across the land. Granted, the liabilities of the shadow banking system have fallen off of a cliff. The latest plunge in the shadow banking system is merely the most recent confirmation that the deleveraging in America is only just beginning. The government, big financial companies and the American consumer are all guilty of fighting deleveraging instead of voluntarily paying down their debt. Like a junkie looking for “one last score”, the entire country has sold out our future to try to keep the artificial high going a little longer. Every independent economist has said that too much leverage was one of the main causes of the current economic crisis. 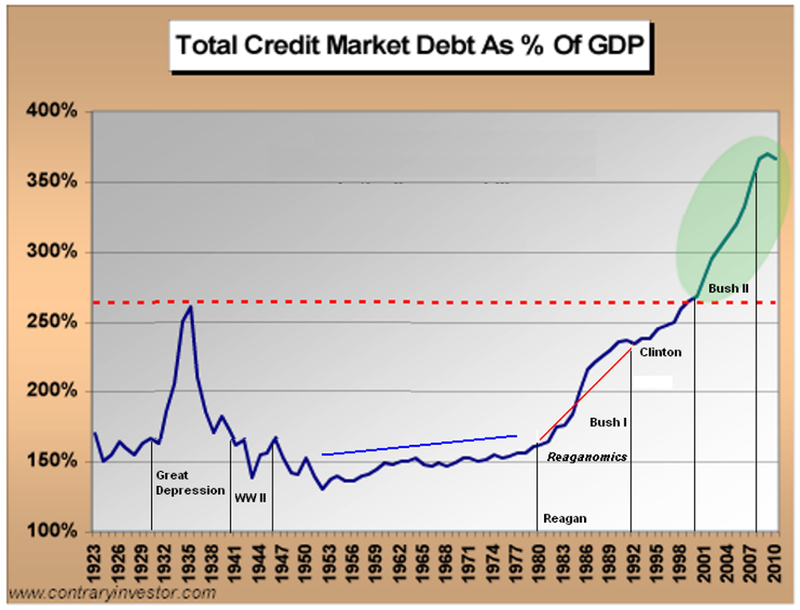 However … the Federal Reserve and Treasury have, in fact, been encouraging massive leveraging. Economists pushing voodoo theories justifying the tremendous increase in leverage were promoted and lionized, while those questioning such nonsense were ridiculed. In other words, economists and financial advisors – in academia, government and elsewhere – have been subservient to the financial elites, and have trumpeted the safeness and soundness of cdos, credit default swaps, and all of the rest of the shadow economy which allowed leverage to get so out of hand that it brought the world economy to its knees. This is no different from the promotion of sports doctors to become team doctor when they are willing to inject various painkillers and feel-good drugs into an injured football star so he can finish the game. If he is willing to justify the treatment as being safe, he is promoted. If not, he’s out. Economists have acted like team docs for the financial giants. When the football team doctor who gives the injured patient steroids and stimulants and tells him to get back in the game, it might be good for the team in the short-run, but the patient may end up severely injured for decades. When economists have prescribed more leverage and told the banks to go trade like crazy to get the economy going again, it might be good for the banks in the short-run. But the consumer may end up being hurt for many years. Using another analogy, this is like prescribing”hair of the dog” to the suffering alcoholic or heroin to the withdrawing junkie. Roubini is also confirming that incurring huge deficits in order to have the federal government itself act as a super-bank is causing a reduction in – and “crowding out” a recovery in – private sector spending. [Roubini also said last year: “Deleveraging requires the writing down of debt as reflationary policies are not a free lunch and won’t solve the debt overhang problem”].